I’m about to blow your mind. For as much I love and adore peanut butter, I have never, ever been a fan of Butterfinger candy bars. This must be some sort of blasphemy in the world of peanut butter love, right? My Chief Culinary Consultant and his parents had to pick their jaws up off the floor when I dropped this bombshell on them last weekend. I’m not sure what it is – maybe it’s because the candy bar is crunchy? A little bit too sweet, even for me? I can’t put my finger on it, but they’ve just never done anything for me. After Halloween last week, we had quite a bit of candy leftover. I’ve been knocking out the peanut butter cups left and right, but those Butterfinger bars were hanging around in the bowl. 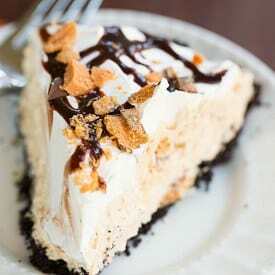 A reader on the BEB Facebook page mentioned making Butterfinger Pie with her leftovers, and I was suddenly intrigued. This sounded like something I could get behind! The result? 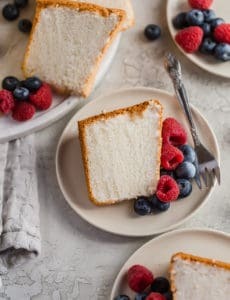 A quite decadent and dreamy dessert that can be made in less than 15 minutes. Also? 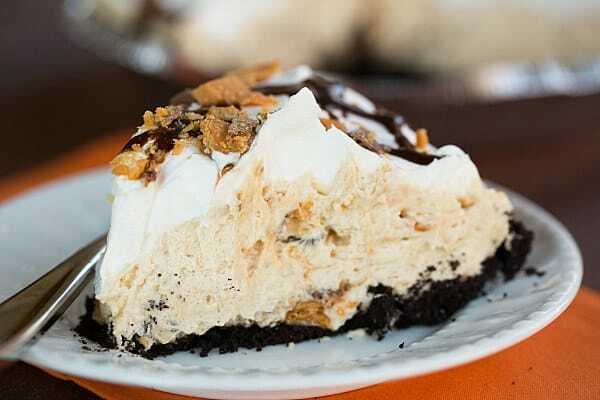 I loved the Butterfinger bars chopped up in the pie! Totally delicious. The only downside is that I couldn’t stop eating it! What’s your favorite way to use up leftover candy (other than eating it or giving it away!)? 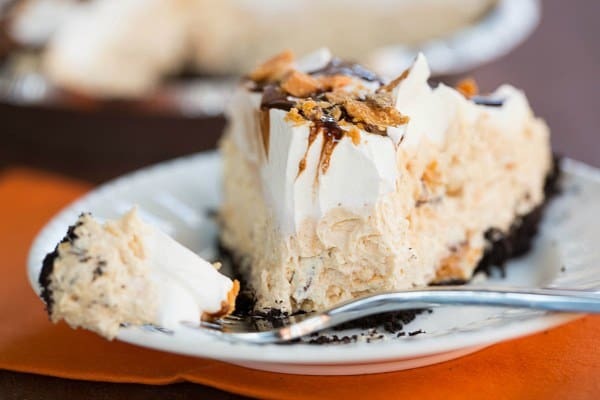 This no-bake Butterfinger Pie couldn't be easier to make, and it's a great way to use up any leftover Halloween candy! 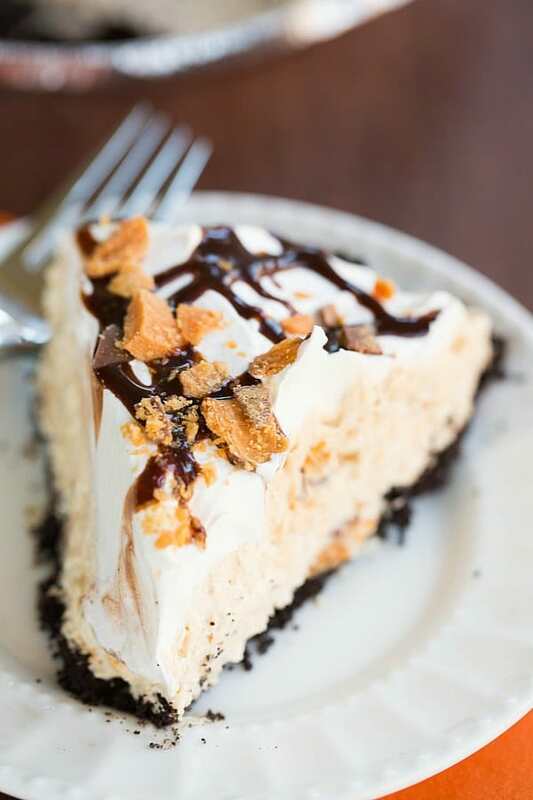 Make the Crust: Combine the Oreo cookie crumbs and the melted butter in a medium bowl and toss with a fork until the crumbs are evenly moistened. Transfer the crumbs to a 9-inch pie plate. Press the crumbs evenly into the bottom and up the sides of the pan, forming a crust. 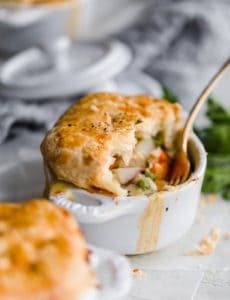 Place the lined pie plate in the freezer while preparing the filling. Make the Filling: Beat together the cream cheese, peanut butter, sugar and salt on medium speed until light and fluffy, about 3 minutes. Using a rubber spatula, fold in the Cool Whip until completely combined, then fold in the chopped Butterfinger candy bars. Pour filling into the prepared crust and smooth into an even layer. Top with the remaining 4 ounces Cool Whip, then refrigerate for at least 1 hour. Before serving, drizzle with chocolate syrup and top with additional chopped Butterfinger candy bars. Leftovers can be stored in the refrigerator, covered with plastic wrap, for up to 3 days. how well does the filling hold up? I am thinking of using organic peanut butter (u know, the kind that seperates in the jar because there are no additional ingredients besides peanuts and maybe a little bit of salt). do u think the filling would be runny if i used this? could i just incorporate some gelatin into it? Hi Jo, The filling is pretty firm, however using natural peanut butter with the oil might make it unstable. What about using a no-stir natural peanut butte? I don’t think I would add gelatin. I love butterfingers so i will try this pie, but i will use natural whipped cream. Just can’t bring myself to use cool whip or serve it.